Two of the nation's biggest carriers, Delta and Northwest, could head to bankruptcy court the same day after years of losses and fuel costs that have wrecked their weak finances even further after Hurricane Katrina. Northwest's board was scheduled to meet Wednesday to decide on a Chapter 11 filing, said Will Holman, a spokesman for the Air Line Pilots Association union, which has a member on the board. An industry consultant briefed by the airline on its plans told The Associated Press on Monday that Delta Air Lines Inc., the nation's third-largest airline, planned a bankruptcy filing late Wednesday after the market closed. The board of directors would have to approve such an action. On Tuesday, Northwest said it had decided not to make $42 million in required debt payments last weekend and Delta shares slipped to 78 cents. Northwest's stock tumbled more than 53 percent as investors digested its bankruptcy prospects. Besides the $42 million in cash it chose to conserve this week, Eagan, Minn.-based Northwest Airlines Corp. said it faces a Thursday deadline to make a $65 million pension contribution or risk having a claim made against its assets, according to a filing with the Securities and Exchange Commission. Northwest spokesman Kurt Ebenhoch would say only that the No. 4 U.S. carrier "has made no decision" on a bankruptcy filing. Airlines worldwide have been stung by surging costs for jet fuel in recent months, with the largest percentage increases coming in the last two weeks after Hurricane Katrina's assault on Gulf Coast refineries. Northwest and Delta have also been hobbled by high cost structures that leave them vulnerable when lower-cost competitors like Southwest Airlines Inc. and JetBlue Airways Corp. force them to match below-cost ticket prices. Northwest, whose mechanics have been on strike since Aug. 20, raised its $1.1 billion target for annual labor cost savings to a new, undisclosed figure, as rising fuel prices have battered the airline. The delayed payments included $19 million owed to Northwest regional partner Mesaba Aviation Inc., which gets its aircraft and schedule from Northwest and operates under the Northwest Airlink brand. A filing by Mesaba parent MAIR Holdings, Inc. said Northwest has until Sept. 20 to make the payment or "Mesaba may exercise available remedies against Northwest." Northwest said it missed other payments totaling $23 million related to aircraft financing that were due Saturday through Monday. It said the terms of those agreements give it grace periods of five to 10 business days before the payments are in default. Northwest said it has not yet decided whether to make the payments before the deadlines. Northwest is analyzing its debt, lease and other obligations to decide which ones to try to restructure, it said. The payments that were missed are ones the company would try to restructure. Northwest also said it began hiring permanent replacements for the mechanics on Tuesday. JP Morgan airline analyst Jamie Baker predicted that if Delta seeks bankruptcy protection it will reduce capacity by 15 percent from current levels, similar to the shrinkage of the two other major airlines in bankruptcy, United Airlines, a unit of UAL Corp. and US Airways Group Inc.
An industry consultant who has been informed of the company's plans told the AP Monday that Delta's bankruptcy filing was expected to come Wednesday afternoon, but could be pushed to Thursday depending on when Delta secures roughly $2 billion in debtor-in-possession financing it is seeking. Baker said the bankruptcy filing would come as no surprise for Delta, which has racked up nearly $10 billion in losses since January 2001. 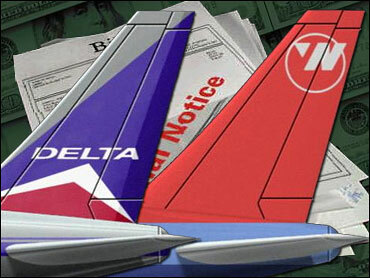 Hurricane Katrina hit Delta hard because of the airline's presence in the South. It had canceled commercial flights to New Orleans and Gulfport, Miss., since the hurricane hit Aug. 29.